Preventive measures remain the best approach to control the spread of hepatitis B virus (HBV) infection. To evaluate the effectiveness of vaccination against HBV, we conducted a 20-year retrospective study on 100 subjects, born to hepatitis B surface antigen (HBsAg)-positive mothers, who had received postexposure prophylaxis at the Clinic of Infectious Diseases (Siena University, Italy) during 1984–2004. All patients were tested for the presence of HBsAg, anti-HBs and anti-HB core antigen (anti-HBc). Two subjects (2%) acquired the infection as shown by the presence of anti-HBc. 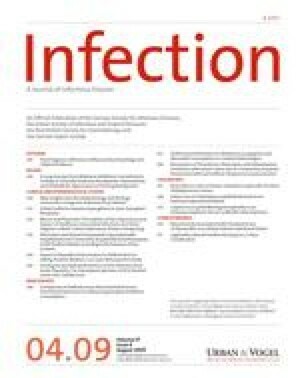 Of the 98 patients who did not acquire the infection, 62 of these (63.3%) had an anti-HBs concentration considered protective (‡ 10 mIU/ml). The percentage of protected subjects decreased in relation to time from vaccination with a significant reduction (p = 0.009) of anti-HBs geometric mean titre (GMT) after 5 years, which reached the level of 10 mIU/ml after about 15 years. No patients without protective concentration have acquired the infection as of today. Only 12% of the HBsAgpositive mothers were followed in specialized structures after pregnancy, reflecting the scarce knowledge of the problem in the general population. Our data, while confirming the effectiveness of anti hepatitis B vaccination, highlight the need for postvaccination follow-up, particularly in high-risk categories, to prolong protection, through booster doses if necessary. We show, moreover, the importance of maintaining active surveillance in the territory to improve follow-up to chronic carriers and to sensitize families.